Some of Melissa’s favorite things to do when she’s not working include reading, watching movies, listening to music, and going for walks. On a sunny day, you can often find her enjoying a scenic walk alongside the nearby pond in Cambridge. Melissa’s research aims to better understand the nature of space and time. To accomplish this, Melissa uses large particle accelerators to collide particles together. This produces a lot of energy in a relatively small space over a relatively short time. She and her colleagues observe what happens when these particles collide under the conditions of excited spacetime that they created. I’d rather do nothing than waste my time. Learning how to play chess from her elementary school principal was Melissa’s first introduction to logic, sustained thought, and algorithms. She enjoyed playing chess and also developed an interest in math. However, Melissa did not have a strong early education in math or science. She left high school when she was 13 to become part of a free school and then later left the free school to travel through Europe. There, Melissa explored philosophy and encountered books by Heisenberg and Bohr, both celebrated physicists in quantum mechanics. This sparked Melissa’s interest in physics. Without a formal high school diploma, she didn’t meet the requirements to be admitted to college, but after visiting the nearby University of Toronto for 34 days in a row, she finally convinced them to let her study physics there. Melissa struggled during her first year of college because she didn’t know how or how much to study, but she became fascinated by particle physics. After a summer working at the Fermi National Accelerator Laboratory, Melissa knew she wanted to continue doing laboratory experiments in physics, so she decided to apply to graduate school. Even today, there are relatively few women in physics. Over the course of her career, Melissa has struggled with people not treating her respectfully and also feeling like she didn’t belong. In one instance, Melissa was excited to receive a job offer from a particular institution, but before she accepted, a few people at the institution brought her into their offices and told her that they knew she wasn’t smart. Needless to say, she declined the position. The conditions for women in physics has improved over the years, and Melissa is dedicated to making the Physics Department at Harvard a supportive and encouraging environment for female scientists. Melissa was a member of the experimental research teams that discovered the Higgs Boson in 2012. The Higgs Boson is the most recently discovered particle and the final particle expected based on the Standard Model of particle physics. Even though there were over 3,000 people whose work led to this exciting discovery, Melissa was thrilled to have contributed an important piece to this history-making revelation. There are only about 20 particles that make up everything in the universe, and this was the second particle Melissa had a hand in discovering. While she wasn’t at CERN when the particle was discovered, Melissa was in close contact with her students who were on site. The students had to sleep inside the lecture hall to get a seat for the big announcement the next day, and there was a big celebration at CERN. Visiting other laboratories and working with researchers there is an experience Melissa particularly enjoys. She once visited a high energy physics laboratory in Japan for four days. They worked non-stop at the accelerator for about three and a half days, went into Tokyo for a few hours and ate a lot of different kinds of fish, and then Melissa was off to the airport to fly home. These kinds of trips are fun because you don’t feel like a tourist since you are working in a lab. You get to experience a place in a different way. One of the quirky things about the building where Melissa works is that there are always people walking up and down the halls lost in thought. For many scientists, the problems they are working on are often simmering in the backs of their minds as they go about their day. Melissa shared a few examples of the funny, distraction-induced things that scientists she knows have done. In one case, a colleague started driving to the airport but realized something important was left at home. The person returned home, secured the item, forgot about the car they left running in their driveway, and promptly took a cab to the airport. Sometimes observing people who are successful can be really helpful. At one point in Melissa’s career, she was really struggling. By seeing how long and hard a scientist she lived with worked, Melissa realized all the effort that went into that person’s success. This helped her put her own life into perspective. For Melissa, finding things out about the universe is the most satisfying thing in the world. She recommends that you should continue to study physics if the time it takes you to solve a problem is shorter than the amount of time you remain interested in the problem. Melissa is an experimental particle physicist who is working on studies of hadron collisions produced by the Fermi National Accelerator Laboratory with the Collider Detector Facility (CDF) and the ATLAS experiment at the Large Hadron Collider (LHC). She works in a collaboration of over 600 international physicists who discovered the top quark at CDF, and 3,000 physicists at ATLAS where she studies particle interactions and symmetries at the highest energies now available worldwide. Professor Franklin was born and raised in Canada, and she received her B.Sc. from the University of Toronto and her Doctorate from Stanford University. She worked as a post-doctoral fellow at Lawrence Berkeley Lab, an assistant professor at the University of Illinois in Champagne/Urbana and was a Junior Fellow in the Society of Fellows at Harvard, before joining the Harvard faculty in 1989. 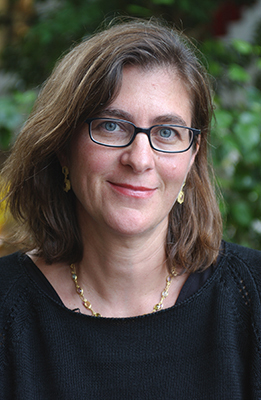 In 1992, Melissa became the first female tenured faculty member in the department of physics at Harvard University.